You can reduce the harmful chemicals in your life by enjoying filtered water at home or on the go if you snag today’s best bargain on Amazon.com, over 30% off select Aquasana Water Bottles, Sleeves, and Filtration Systems! 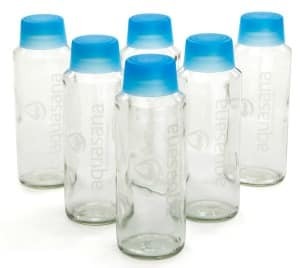 You can pick up a 6-pack of Aquasana 18-Ounce Glass Water Bottles for just $24.99 (Regularly $39.99) with FREE Super Saver Shipping! These reusable glass water bottles have BPA-free plastic lids and are dishwasher safe. I also spotted other highly rated items like glass bottles with silicone sleeves and shower head and faucet filtration systems. Head on over to find what meets your needs.